This project was initiated in order to promote and facilitate collaborative work and to give to self-emerging communities through the web, a way to realize their ideas and projects. This site is for people wishing to implement a project and to those who want to participate in existing projects. The philosophy of this site is such that the work is self-organizing. Each participant has the same responsibilities and keeps the control over what he writes. However, the creator of the project plays anyway the role of moderator. The following presentation is not complete as the site interface is sufficiently intuitive. The process of project management is reduced to its simplest form to make this site the most accessible. What purpose do you want to achieve and what problems do you encounter. Establishment of a list of realisations needed to achieve a solution. For each solution, we can define a deadline of achievement. For each realization, we can define an importance, a deadline of achievement and a state of progress. 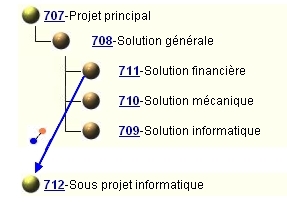 In the detail of the solution, an assessment of the achievements is proposed. A little drawing in front of the title of the realisation reports its progress state. each participant can add information, documents and comments for each project component. This application allows a great margin of freedom for project management. In what follows, I present some possible techniques. Although a project applies to a specific domain, its realization may require different skills. It is then necessary to split the project into subprojects, each for a specific domain. Suppose that our initial project leads to three solutions, one computational, another mechanical and last fiscal. 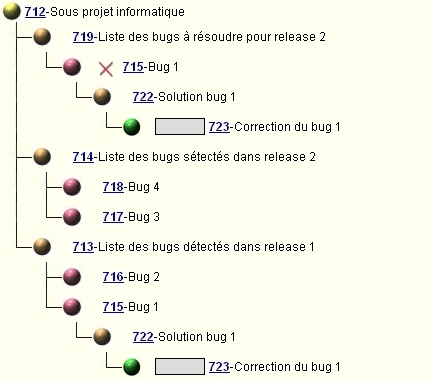 Each IT project should have a procedure for bugs'management. 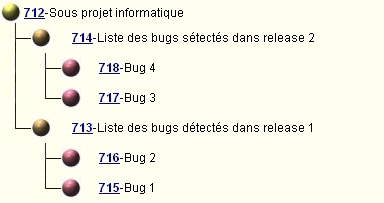 In this case, we propose to create a solution "List of bugs detected for release..." for each release. In this list, add each problem (bug) detected. Then we create a solution "List of bugs to solve for the release..." for each release. We then copy the desired bugs from the list "List of bugs detected ..." to the list "List of bugs to solve ...". It creates a new instance for the element and all its children (useful for regression testing). It creates a link to the item. In our example, if you bind a bug of the list "list of bugs detected ..." to a bug of the list "List of bugs to solve ...", it means that all changes over this bug will apply to both lists. It removes a bug from the list "List of bugs found ..." to put it in the list "List of bugs to solve ...". Each IT project should have a testing procedure. For each realisation, you can create an associated test. 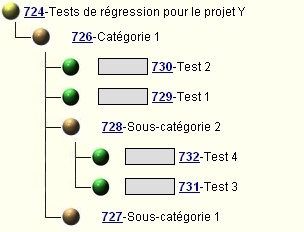 Create a project called "regression tests for project Y. Add solutions, sub-solutions for each category, subcategory where you will place the regression tests. In each section, add the associated tests. When, in your project, you have to use regression tests, copy the desired tests from the project "Regression tests for the project Y" to the desired location in your project Y. To copy a set of tests in a category, use the "Copy with children" functionality. If you want to go further, you may try this site without publishing anything.